I love the post office.Â I get mail all the time and I sent out a fair amount of packages.Â I like going to the post office, I like getting mail and I like sending mail.Â Itâ€™s like having presents the government is giving me.Â But thereâ€™s a whole different world inside of the bureaucracy of the post office and now you can learn all about it through this great television program on DVD. Starting this May 12th, now available on DVD from Infinity Entertainment Group and Smithsonian Networks comes a fascinating look at one of the most pervasive parts of public service that most of us just take for granted.Â Bombs, Bullets & Fraud is ready to be delivered right into your living room, bringing with it a fantastic look at the dangerous and much more interesting of life in a mailroom.Â Bring home this educational and action driven story about mail today! We all get mail on a nearly daily basis.Â Itâ€™s usually cards, bills, junk mail and the occasional package.Â But there is stuff far more unusual, and far more deadly, thatâ€™s sent through the mail every day.Â Now you can have the chance to see those bizarre and/or lethal items and learn all about the people who work hard to protect you from all that mail.Â Ever since 1772, making it the oldest federal law enforcement agency, the Postal Inspectors Unit has been on the forefront of crime investigation.Â They stopped the first Ponzi scheme, they caught the Unabomber, they investigated the anthrax mailings and they even help solve murders.Â Even though itâ€™s the post office, they have a lot to do with all sorts of crimes and they put their lives on the line to keep us safe. The special features included in this DVD are a widescreen format, Dolby Digital Surround Sound, subtitles and two great featurettes.Â The first is about the Leeper mail bomb and the second, which is even more interesting, is about the Dâ€™Autremont Train Robbery.Â Ever since I started watching these releases from Smithsonian Networks, Iâ€™ve been saying that there need to more special features, more featurettes.Â Now that they have added some, it makes all the difference and bumps these DVDs up from great to superb. This is embarrassing in the first degree, but I had not even heard of the Postal Inspectors Unit.Â I do remember when they caught the Unabomber, but just about everything else in this was all news to me.Â This is a very in-depth and highly exciting television show and it is well worth watching.Â It is very informative and itâ€™s so easy to watch.Â Once again, Smithsonian Networks continue to raise the bar as they outshine the bigger and more established channels that specialize in educational information.Â The post office is a vital part of our lives and it can never hurt us to understand it a little better.Â With this show on DVD, we will understand it a whole lot better. As far as education and mail go, this DVD is the Bomb! 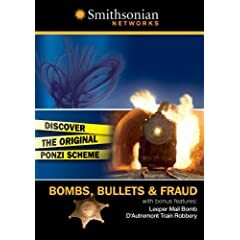 No user commented in " Movie Review: Bombs, Bullets & Fraud "